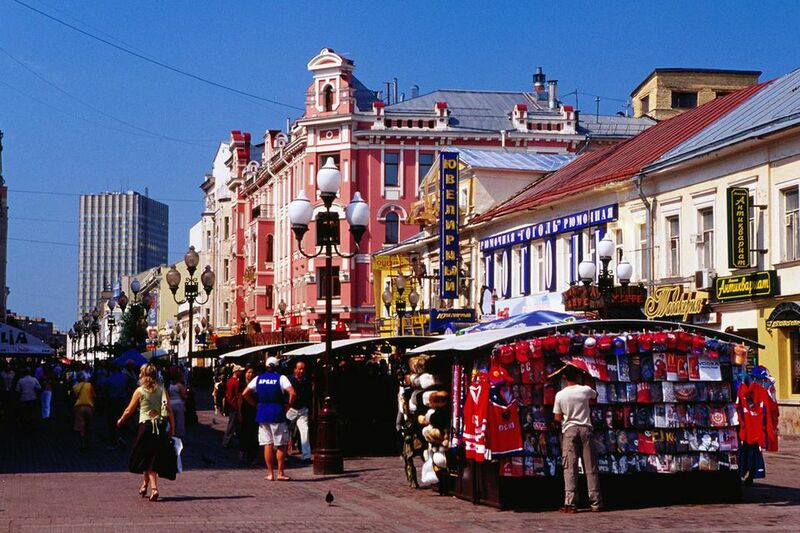 Arbat Street, or Ulitsa Arbat, is also known as the Old Arbat (to differentiate it from New Arbat Street). Arbat Street once served as a main Moscow artery and is one of the oldest original streets in the Russian capital. The Arbat District, through which Arbat Street runs, was once a location where craftsmen set up shop, and the Arbat's side streets show evidence of their past with names that describe various trades or products, like Carpenters, Bread, or Silver. Arbat Street is within walking distance of the Kremlin, so it's possible to visit this free Moscow attraction when you visit the heart of ancient Moscow. During the 1700s, Arbat Street began to be looked upon by Moscow's noble and wealthy community as a prime residential district, and it eventually began to be settled by some of Russia's most famous families and notable individuals. The famous Russian poet, Alexander Pushkin, lived on Arbat Street with his wife, and visitors can stop at a museum that preserves the house in his honor. Other famous Russian families, like the Tolstoys and the Sheremetevs, also had houses on Arbat Street. Fires damaged many of the oldest Arbat Street houses, so today its architecture is a mixture from different styles, including Art Nouveau. It wasn't until the 19th century that Arbat Street gained a central location in Moscow because the city's prior development had meant that the street was on the outskirts until this time. Taking a stroll down this street, it is possible to imagine how Moscow might have felt during Pushkin's or Tolstoy's time, though now it is a highly touristed area that is congested with sightseers, buskers, and street vendors. Additionally, it was only in the 1980s that Arbat Street was closed to motor vehicle traffic and made a pedestrian street, so even Pushkin would have had to have dodged carriages and carts while taking a stroll outside his residence. While Arbat street's significance lies in its history, Arbat Street today is a lively and interesting Moscow attraction. The Pushkin House-Museum, identifiable by a statue of the poet, can be visited--as the Father of Russian Literature, Pushkin deserves to be paid homage to at the sight of one of his former residences. One of Stalin's Seven Sisters, the Ministry of Foreign Affairs is on Smolenskaya-Sennaya Square. Other attractions include a monument to the songwriter Bula Okudzhava; the Melnikov House, built by constructivist architect Konstantin Melnikov; the Wall of Peace; and the Spaso House; and the Church of the Saviour in Peski. Some visitors to Moscow complain about the touristy nature of Arbat Street. Buskers and beggars take advantage of its popularity, and street vendors take advantage of deep pockets. Pickpockets may be hiding out on Arbat Street, so keep your personal possessions close. Arbat Street, despite its popularity and the way it attracts those who prey on tourists, is still a Moscow must-see sight. If you've never been to Arbat Street, take time to see it at least once. Over the centuries, it has worked its way into the Russian cultural psyche, which means you'll find it referenced by Russian artists, musicians, and writers.